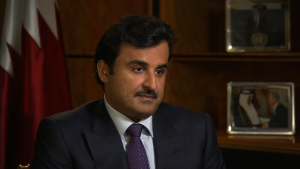 Qatari Emir Sheikh Tamim bin Hamad Al Thani denounced the blockade imposed by three Gulf neighbors (Saudi arabia, UAE and Bahrain) in addition to Egypt as “futile” and voiced confidence in his country’s ability to ward off the ramifications of such an embargo. “It has been a futile crisis manufactured by our neighbors, some of whom are major regional players, once believed to be stabilizing factors on the world stage,” Sheikh Tamim bin Hamad Al Thani said in a speech at the Munich Security Conference in Germany. “By defusing the impact of the illegal and aggressive measures imposed on our people, Qatar has preserved its sovereignty,” Sheikh Tamim said. The Qatari ruler also called for more cooperation and agreement between Arab states, and said nations in the Middle East should promote a flow of humanitarian aid between the region, access to religious sites for all faiths and the prevention of “desecration” of historic and religious sites. Sheikh Tamim insisted for a comprehensive security settlement in the Middle East, saying the region must be brought back from the brink of disaster. Written by: Jaber Ali on February 19, 2018.on February 20, 2018. Posted by Jaber Ali on Feb 19 2018. Filed under Headlines, World News. You can follow any responses to this entry through the RSS 2.0. Both comments and pings are currently closed.